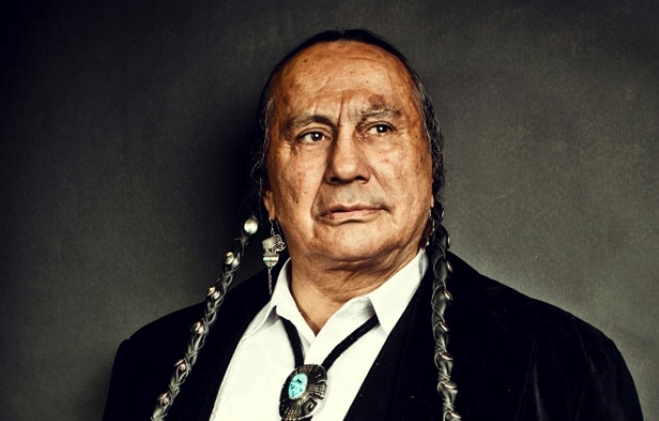 Russell Means (1939-2012), the American-Indian (Oglala Sioux) activist and actor (Chief Chingachgook in "The Last of the Mohicans") is of one of the country's most famous Native Americans. In this unscripted monologue, delivered June 9, 1993 from a junk site in Gallup, New Mexico, Means (then 54) calls our attention to environmental injustices, telling us that even western science has verified that the earth is a living organism in space (as Dr. James Lovelock, and then Dr. Lynn Margulis, hypothesized in the 1970's about the planet's interacting systems, defining the Gaia Theory). Means tells us, "Mother Earth is what its all about...She's a live being... She hurts, she feels, like you and I." The monologue was originally shown at the end of the play, "Wheels Over Indian Trails" based on his life. Coming from a long oral tradition, Means felt information, especially that about the big environmental picture, shared by all life on earth, should be out there, free to be heard. He liked the Internet age for that reason. Russell Means has lived a life like few others in this century – revered for his selfless accomplishments and remarkable bravery. He was born into a society and guided by a way of life that gently denies the self in order to promote the survival and betterment of family and community. His culture is driven by tradition, which at once links the past to the present. The L.A. Times has called him the most famous American Indian since Sitting Bull and Crazy Horse. His indomitable sense of pride and leadership has become embedded in our national character. Responses to "Earth First: "We are all related" a message from Russell Means "
Be at peace dear Russell. Rest wel my dear friend. I loved to here hi talking.